Equip product pages with the advanced SEO-optimized FAQ section. Provide customers with additional information on products and services in your store. Let visitors ask questions and efficiently manage your own knowledge base from the backend. Utilize the efficient set of tools including the question and answer grids, powerful WYSIWYG editor, and advanced SEO capabilities. Product questions are the de-facto industry standard for the European and American e-commerce websites. They help merchants to increase search engine optimization efficiency by letting store visitors generate content for the knowledge base. Tweak meta title and description, avoid duplicated content with short and full answers to attract new visitors and convert them to happy customers. Magento 2 FAQ and Product Questions extension allows you to achieve multiple e-commerce goals with a single toolkit. This Magento 2 FAQ extension enables you to equip each product page with a well-organized list of product questions and answers. As well as provide a separate FAQ section that will accumulate all product and other questions around the site. The module allows you to answer questions from your customers or create your own queries to display important information. Group similar questions by categories to simplify navigation and make information easy for perceiving. Rapidly grow your knowledge base by letting your shoppers get more information related to products and services in the store. Enable them to ask new questions and provide them with detailed answers. If a customer is not willing to contact you directly, he can still find the needed info in the knowledge base. Hence, the extension is a free source of user-generated content. With the Magento 2 FAQ module, each question can be assigned to a particular product or category. Queries from the product pages are automatically assigned to the corresponding product. Both user-generated and manually added questions will help you to lower the volume of support requests by providing the important information in the FAQ section. Divide Magento 2 knowledge base into smart categories that will ease navigation and help store visitors find the required information faster. You can display the same questions in categories and on product pages, define their position in the list and edit right from the categories grid. Extra store pages with the content optimized to search queries will definitely improve your domain positions and bring more relevant traffic. The extension allows both guests and registered customers to add their questions. You can adjust the policy to limit this ability to logged in users only. The detailed information about a question author is available when providing the answer to it. Visitors can use the search bar to find relevant questions and categories. This powerful full-text search highlights results to let customers quickly find the required information. The more users interact with store pages (browse FAQ categories, read answers, search for content) the higher the chance they will be involved in the process of purchasing from you. According to Dan Ariely and his researches on the behavioral economics, the questions on a particular product provides social confirmation about the intense interest to it. Answering customers questions directly affects conversion. Your detailed answer can easily dispel fears and doubts of a particular shopper who makes a purchasing decision. Equip each question page with the appealing social sharing buttons. Quickly adjust the list of supported social networks to increase your store presence in social media. Get extra visitors from the useful FAQ content shared by your customers. Easy site navigation is the key to your successful interaction with customers. Tags will help your clients instantly find the information they are looking for. Time is money – remember the simple truth. Add customers' rating to each question. Choose between two convenient schemes of casting a vote to clearly show store visitors the popularity and importance of particular topics. Modify the rating of certain questions according to your specific needs. Provide customers with the well-designed FAQ main page. Utilize the default FAQ CMS page to display a search bar and the essential list of categories with questions. Adjust the design to your specific needs and content in the knowledge base or create your very own page layout using FAQ widgets. Utilize 3 types of widgets to include FAQ elements in various CMS-pages. The module comes with the search bar, categories block, and the 'Back to Product' button widgets. They come with separate settings that can be configured separately for every page. All these widgets can be added to both new and existing CMS pages. The main module focus is the ability to turn the ordinary FAQ section, that is important in itself, into the search engine optimized knowledge base. This might even result in a higher positions and greater visibility of your Magento 2 store in SERP. From short and full answers to breadcrumbs and configurable URLs — the extension provides store admins with a full set of tools to avoid duplicate content and increase store page ranking in search engines. According to forecasts, 50% of all online searches will be made through voice search in the coming years. Thus, SEO optimization to voice search becomes a critical point in increasing conversions and brand awareness. Starting from 2019, FAQ sections significantly help with SEO optimization for voice search as Google introduced “zero results”. Such results appear above the 1-st traditional ranking position and often show content from FAQ and product questions. This provides you with a much greater guarantee to get to voice search results. When you add a new query or answer the existing one, the extension automatically generates a unique URL for it to save your time. However, you can always specify your own URL to make it shorter and more optimized for UX and search engines. Each question and category includes meta title and description that can be set and edited from the admin panel. The meta title can be filled in automatically using the question title. The extension helps you to avoid limitations of a product description. In the FAQ section you can utilize all additional synonyms, keywords, long-tail keywords, and other content that is unacceptable in the product description but required for SEO purposes. Product questions with short and long answers are the most natural way to implement all these text content and get benefits. Provide store visitors with a short preview and a complete answer to make your Magento 2 knowledge base content respond to different users’ need. By using short and long answers you can provide more diverse content that is more relevant to shoppers’ needs. Duplicate content is one of the most dangerous SEO threats. Luckily, the FAQ and Product Question for Magento 2 module will help you to avoid it. With the module, one can easily provide the different answer preview on a product and category pages. Implement the FAQ section navigation into your store structure and help search engines browse your site correctly by using breadcrumbs. Lower the bounce rate by providing customers with the clear routes around your Magento 2 store and its knowledge base. Also, by increasing the customers’ average time on site you will raise chances for successful conversion. Make your store more appealing in search results and achieve higher ranking with rich snippets. 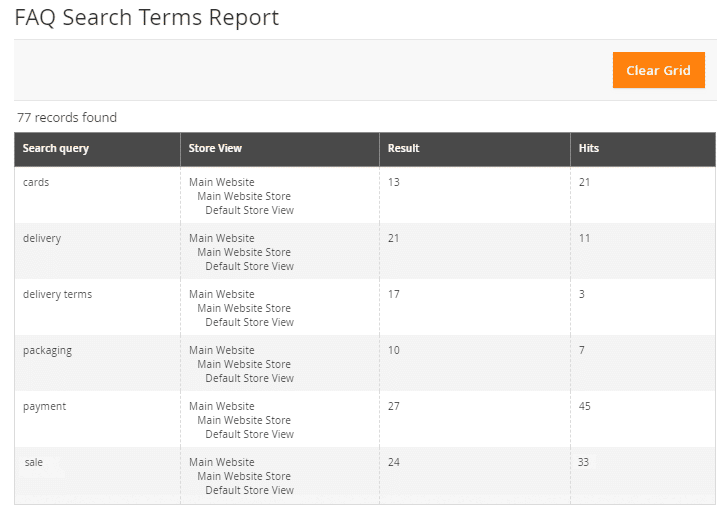 Display the knowledge base structure with rich data breadcrumbs and generate accurate rich snippets for attracting new store visitors from Google. With the extension, you can adjust multiple search engine related settings for question and category pages. In addition to meta title and description, you can set the canonical URL for each page of the knowledge base. Moreover, the 'Noindex' and 'Nofollow' settings will help you avoid duplicate content and preserve the link juice within the required pages. All your knowledge base URLs can be easily included into the Magento 2 XML sitemap. Also, you can define the update frequency and priority for the FAQ pages. The extension is fully comatible with the Amasty Google XML sitemap module. Make your FAQ section highly efficient thanks to analyzing and utilizing the data gained in the FAQ Search Terms Report. See all FAQ search queries, define the most popular ones and update the content to make it maximally relevant to customers’ demands. Magento 2 Product Questions can be easily managed from the backend. All questions whether they created by customers or store admins are displayed on the Questions grid. Right on this grid, you can select a question to add an answer, modify its URL, set meta data, adjust its visibility on the frontend, and assign it to a particular category. Customer satisfaction depends on various factors and your attention is among the most important ones. Thus, you can notify a shopper who added a question using the email template that can be sent when you submit a new answer. Also, the extension allows to reply directly to a customer without adding the answer to the knowledge base. Since even guest visitors can add questions to your FAQ section, you need to make sure no spam or vulnerable activities can affect your Magento 2 performance. How do you do that? We have already taken care of this and built in our Invisible Google reCaptcha. With this tool in place, no suspicious requests will go undetected. Learn everything about our reCaptcha flexible settings to keep track of its every feature. Enhance navigation throughout the knowledge base with descriptive category icons. Provide each category with an icon to make the information structure understandable. Moreover, you can provide a short description for each FAQ category in order to clearly show the exact questions content. The extension comes with the powerful search. It allows customers to search the knowledge base separately and get the detailed search results preview. On top of that, you can add the FAQ search bar to any CMS page as a configurable widget with the adjustable bar width and alignment. Set the exact position of each question in the category right from the grid. With the module, you can show more important and frequent questions on top while moving the others lower by defining their position. Moreover, the option allows you to display questions based on their views to make sure the most popular ones are always on top. With the module, you can see question status on the grid: queries that require your attention (Pending) and the ones that have already been submitted (Answered). Also, you can adjust questions visibility on the frontend for guest users and registered customers. The FAQ and Product Questions extension for Magento 2 enables you to provide not only the text answers but also include various content in your knowledge base articles. Thanks to the advanced WYSIWYG editor you can equip answers with images, links and even PDF files to provide visitors with the comprehensive information on topics of interest. Avoid creating too long category pages by limiting a questions number and answers per page for categories and search results. The remain questions will be available using pagination. Also, you can reduce a number of question for product pages to display only the most important ones. Encourage guests to register - forbid them to leave questions until they log in. This will also protect you from spam. Easily equip product pages with the new FAQ tab and choose its position among other tabs. On top of that, you are able to implement links to the knowledge base into the toolbar, categories menu, and footer. Additionally, the module has multi store support that allows you to provide separate FAQ sections on different store views. In case you've been using the FAQ and Product Questions module for Magento 1, you can easily move questions and categories to your new Magento 2 installation. Export the existing data and flawlessly import it to Magento 2 FAQ and Product Questions extension with a few clicks. Moreover, you can backup or transfer the whole knowledgebase using the export functionality. I grabbed this at xmas sales in addition to seo kit just for the discount. Works as described and much simpler than the kit in setting it up, though lacks more useful layout configs. Someone says tags are out of date I checked my users still use them for switching between topics. Also it’s very efficient (at least for my store) in connection to social networks that you can set. The module is very very simple. The one thing to note is the wysiwyg could work better still sometimes I have to turn back to the html tags. Only 2 months I’ve bought it and they already added new functionality. Though back to product page button and short answer field are not something new, still better than without.